A 220-acre plot of land in Orlando, Florida was the site of an incredible array of heavy equipment up for auction in February. Ritchie Bros. held its largest event to date, spanning six days with sales of more than 13,350 assets totaling over $297 million. More than 15,900 bidders from 88 countries contributed to the seven percent increase in revenue over last year’s event. Of those participants, over 11,300 were online from locations across the globe. Ritchie Bros. was established in 1958 in Canada and specializes in buying and selling used heavy equipment, trucks and other assets. They operate in the construction, transportation, agricultural, energy, oil, gas mining and forestry markets with the world’s largest auctioneering service plus an online marketplace and even equipment financing. Their U.S. headquarters is located in Lincoln, Nebraska with over 40 permanent auction sites in North America, Europe, the Middle East, Asia and Australia. They’re publicly traded on the New York and Toronto Stock Exchanges and employ more than 2,000 people worldwide. Ritchie Bros. helped more than 1,150 companies sell their items, including Sims Crane & Equipment. U.S. buyer purchases totaled 85 percent, with Australia, China, Colombia, Germany, Nigeria, and the United Arab Emirates representing the other 15 percent. Online buyers accounted for approximately 49 percent of sales. By the end of the event, 13,350 pieces of equipment were sold at a gross transactional value (GTV) of $297 million, which was the most equipment sold during one auction in Ritchie Bros.’ history. Every item up for auction was sold. Included were in excess of 800 excavators, 640 compactors, 430 loaders, 395 skid steers, 385 dozers, 210 articulated dump trucks, 240 dump trucks, 465 aerial work platforms, 465 truck tractors, plus many other pieces of equipment and machinery. In the lifting category, 27 rough terrain cranes, 25 hydraulic truck cranes, 18 crawler cranes, 14 carry deck cranes and 12 all-terrain cranes were sold. 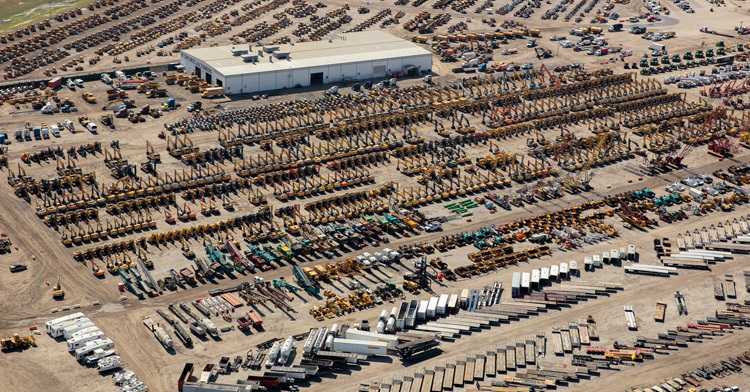 For more details, check out “Orlando auction serves as ‘Super Bowl’ of selling” at American Crane & Transport (ACT), “Ritchie Bros. hits US$297+ million in world’s largest equipment auction” at PRNewswire.com, and “About us” at Ritchie Bros.’ website. Image above courtesy of Ritchie Bros.